The Allan W. Purdy Distinguished Service Award is one of the highest awards that NASFAA bestows and may be awarded either for significant contributions in the furtherance of NASFAA's goals over a sustained period of time OR for a single contribution of such momentous importance as to deserve the award. An award recipient may come from the financial aid, political, educational, business, or other community. In addition to any selection(s) made from nominations for the Allan W. Purdy Distinguished Service Award, the association normally recognizes the significant and sustained contributions of the NASFAA National Chair with this award at the end of the Chair's term. 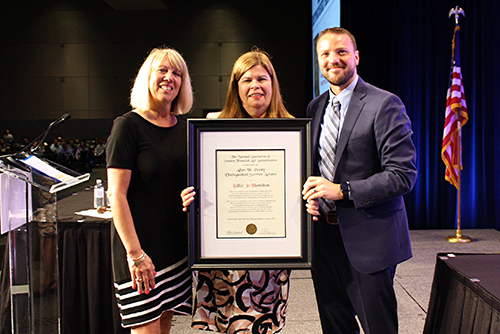 Billie Jo Hamilton has made significant contributions in the furtherance of NASFAA’s goals over a sustained period of time, including serving as National Chair in 2017-18. Her career has spans 35 years and five states, including directorships at the University of Kansas Medical Center, the University of Tennessee-Memphis, Missouri State University, and Southern Illinois University Carbondale. Currently, she supervises the offices of Admissions, Registrar and University Scholarships & Financial Aid Services at the University of South Florida. She is a past state president (Kansas) and has held numerous elected and appointed positions in RMASFAA, SASFAA and MASFAA. She has served as NASFAA conference chair, NASFAA Leadership Expo chair, as a commission director, and has presented numerous times at the NASFAA Leadership Conference. She has also held a three-year term as a Representative at Large on the NASFAA Board of Directors. Billie Jo has served at every level of the state, region, and national associations. She is a shining example of servant leadership. Her depth of knowledge and commitment to the profession has been extremely valuable over the years.